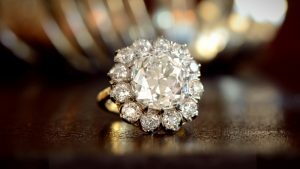 Diamond engagement rings can be expensive so, instead of stumbling blindly through an area of expertise that actually very few people have, how can you go about maximizing the buying experience, and making sure that you have a handful of relevant snippets of knowledge that will help along the way? It’s not about knowing what ring you will be buying, but more about knowing what you’re looking both for and at. Before spending $6,000 on an engagement ring, because that’s the US average, it pays you to know what you’re doing before you pay someone else. As with many things, when buying a diamond engagement ring, forewarned is truly forearmed. The average price US couples pay for engagement rings is a good place to start, because the most important first step is knowing your budget. It’s often nice to set your budget a little lower than you might ordinarily do, because this brings the benefit of then being able to stretch it a bit without worrying about spending an amount you may not be able to fully afford. Click here to read the definitive guide on how much to spend. Form a practical point when it comes to browsing the collections of engagement rings in your chosen stores, knowing what you’re actually looking at can save both time and money, and allows you to have proper, in depth conversations with the store staff. The most comprehensive way to do this is by learning a bit about the 4 Cs of diamond classification. These are Color, Clarity, Carat and Cut. Each will determine both the quality and the cost of your chosen ring, regardless of whether you are choosing a loose stone to be set into an existing mount, or whether you are buying a finished antique ring. 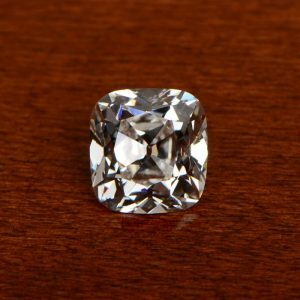 Although the levels of knowledge about diamond quality that only years in the industry can bring aren’t attainable in a short period, knowing a little about what the color and clarity of a diamond indicate will help you appreciate why two seemingly identical stones have very different prices. Although the color part of diamond classification might sound simple, an untrained eye will rarely be able to differentiate between several different colors on the scale. Fortunately, the scale is pretty easy to follow, with colors rated from colorless to yellow on an alphabetical chart which goes from D to Z. The later the letter in the alphabet, the more yellow the stone is. Obviously, the less color in a diamond, the more desirable it is, so expect one classed as D color (colorless) to be up to twice the cost of one classed as I or J (near colorless). Usually, diamonds classed above L color wouldn’t be considered for use in an engagement ring unless a conscious effort to set a “yellow” diamond is being made. Diamonds above L color do have a discernible yellow color, but can look spectacular when set in yellow gold, where the warmth of the band combines perfectly with the slightly warm tone of the diamond. The Clarity of a diamond is something a little more complicated. In case you’re thinking that color and clarity are basically the same, it’s not the case. Clarity in diamonds is the measurement of the visibility of any inclusions, or imperfections, in the stone. These range from flawless (FL) through various states of included, from Very Very Slightly Included (VVSI) to Slightly Included (SI1 and SI2) and ending with 3 states of included (I1, I2 and I3). It may come as a surprise to know that flaws in grades down to Very Slightly Included are rarely visible to the untrained eye, and yet such diamonds may sell for much less than FL or VVSI. For you, the buyer, this means that a VSI diamond may well be perfectly suitable, rather than spending much more on near-flawless diamond. Knowing these grades will provide a major boost to your browsing. Cut and Carat are the two simplest parts of the 4Cs. The cut is the shape and proportion of the finished diamond, and various cuts have been developed over the centuries to maximize the reflective properties of each stone. A particular cut may have been chosen to work around inclusions or to reflect available light better. 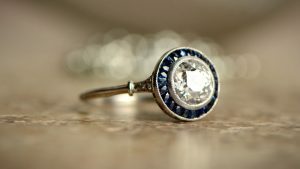 As an example, an old mine cut diamond was intended to reflect as much candle light as possible, as this was the only available light source when it was developed in the early 19th century. The Carat is the weight of the polished diamond, with 1 carat being equal to 0.200 grams, so a 5 carat diamond will weigh 1 gram, or about 0.36 ounces. 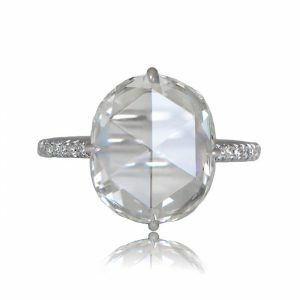 If multiple diamonds are included in a design, it is common to state the carat of the center stone separately from any additional stones. In addition, the center diamond will often be of a higher quality than the smaller diamonds, given that smaller stones show inclusions far less easily to the naked eye. So, now that you know the technical details of how diamonds are graded and valued, what else do you need? The most obvious of these is the metal to be used for the band. Platinum is very commonly used for diamond engagement rings, as the base metal color lends itself superbly to the whiteness of the diamond, and it is very durable. Yellow gold is also regularly used but, in an attempt to get the platinum effect at a gold price, more and more white gold is being used as it closely resembles platinum. The problem with this is that some methods used in producing white gold include nickel being present, which can cause significant skin irritation in some people. If you know you don’t have a problem with nickel, white gold is a definite option but, otherwise, look for white gold that doesn’t include it, or choose something else. The style of the ring is always going to be a very personal thing. You may want the engagement ring to complement other rings, or you may intend the wedding rings to finish the set. If you choose to make a surprise proposal, this is the trickiest bit, as you are deciding the style for your partner and, usually at least, you only get one go at it. Finally, and again this is something surprise proposers need to consider, is the size. An engagement ring is designed to be worn every day (even though that’s not always the case) so the size has to be right. Fortunately, this is one thing that can, in most cases, be corrected after the event. Some ring designs can’t be resized very much, so just beware of this and ask the store what is possible. Buying an engagement ring isn’t necessarily complicated, but it should be measured and done with a clear head and some knowledge that will see you through to the best possible conclusion. Do you want to know which style suites you best? Click here to take our online engagement ring style quiz.